Kick off for Felon's economic rights organization. The purpose of Full Citizen will be to provide a path back to full citizenship for felons. I say path because it will not, cannot,and should not be and instant process. Regardless of the circumstances that caused one to break the law the public has a reasonable distrust of felons and felons must earn back the trust of the community. Currently there are approximately nine million felons nationwide. Under our current system a felon is prohibited from being licensed for 64 professions for life. The felon with a drug offense cannot get federally underwritten school loans for life. The felon cannot get federal school loans for life. The felon cannot get business loans from federally insured banks for life. The felon cannot get a mortgage for life. (Romona says I am wrong on this one but as a Realtor that was my understanding) Thus all of the paths to wealth in our society have been permanently denied to the felon. Thus a felon has two choices. He or she can live in poverty or he/she can re-offend in the hopes of the big score. Felons younger than thirty frequently re-offend and older than thirty generally settle down into minimum wage part time poverty. The children of these felons suffer from a variety of social ills. Single parent homes and sometimes no parent homes. Raised by Aunties who may be holding down two part time jobs they have little supervision and even less in the way of successful role models. The sentencing project says that two in three black boys age ten predict they will go to prison. The boys prediction is both logical and self fulfilling. So the goal is to give parents a route to success and give children a positive role models and a rational expectation of their own success. To do this voters must be educated to change the law for the interest of those effected and for the interest of society as a whole. Full citizen will utilize video journalism, blogging, and community activism to make a wholesale change to the laws of Missouri and eventually to the laws of all fifty states. This is a tremendously worthwhile group. Nine million adults and untold numbers of children can be effected. The economic and social cost which can be alleviated are staggering. We desperately need your minds and your labor to correct the injustice which currently guarantees a permanent underclass. If you have any interest please contact me at Mark.Magas@gmail.com or call 314-497-6475, and if you know how to create an event on Facebook that would be a great start. Russ Carnahan was interviewed recently on the Jaco Report. I really liked the interview, particularly because Carnahan was honest about questions like "was this essentially blackmail?" rather than trying to spin it. I also appreciate the fact that he's taking steps to change the conversation about Afghanistan at a time when other politicians don't want to look at it with clear eyes. After the last elections, it would have been easy for Representative Carnahan to try to turn into a "blue dog" and spout right-wing rhetoric. However, he clearly understands that his future in politics depends on being true to his principles, and I commend him for that. Updated with more coverage: see below. After an hour of protesting and singing parody Christmas Carols outside Bank of America, to attempt to work help a family in day 408 of the loan modification process, six people were arrested by Clayton, Missouri police attempting to enter the Bank branch. Someone inside the bank was repeatedly told that Bank of America would get someone on the phone to deal with Mike and Mary Boehm’s loan, but negotiations proved fruitless. At that point, one homeowner with a January 10th sale date and 5 friends and neighbors of the Boehms attempted to enter the bank and were arrested, at 7800 Forsyth Boulevard. The demonstrators were accosted and quickly arrested and are still being processed. Pictures and the local news release are attached. Mike, who is now working as a Buyer for an Illinois based company, has done everything he can to be able afford to continue making payments. “We are current on the modified payments that Bank of America told us to make and they are still foreclosing on us” says Mike. According to St. Louis area housing counselors, Bank of America is one of the worst servicers for families seeking permanent loan modifications under the Making Home Affordable (HAMP) Program. Bank of America ignores repeated calls, refuses to modify loans, and will not assign people in trouble to one counselor. -Froze foreclosures temporarily to create decent servicing practices. Those are the larger issues that Mike and Mary, MORE, and the arrestees in Los Angeles are fighting for. Seriously, who would think that applying statistics to large samples of people would be a good way of gauging opinions when you can instead talk to people like Gina Loudon? Ed Martin has been spending the last few weeks positioning himself for a run for office in 2012. Apparently, he thinks the best way to do that is to show how utterly clueless, out-of-touch, and regressive he is. I'll try to update when I see additional coverage. First and foremost, I believe it is wrong to punish innocent children for the crimes of their parents. This bill would ONLY have applied to children who were brought here at least five years ago by adults, children who were under the age of 16 at the time and had no choice. These are not children who made a decision to break the law. These children were simply the victims of adults who were law breakers. Unlike the last time this legislation was considered, this bill was much more narrow in scope. The children that would have been allowed to stay in this country are those who have already been here for five years at the time the legislation is enacted. If someone illegally came to America after this bill was already enacted, they would not be eligible. In other words, this bill cannot be a magnet for future illegal immigration. Lastly, these children must meet very strict criteria, such as proving themselves of good character during their time in the United States and during 10 total years of conditional residency, which can be readily revoked at any time. The application process also included other rigorous requirements including health examinations, background checks, and the completion of two years of college education or military service. I know many of the young people that would have been impacted by the legislation would love an opportunity to serve this country in the world’s finest military. Kudos to Senator McCaskill for standing up for what's right! Wagman "Has To Try To Be That Bad"
It’s time to get smarter about how we approach this phase of our operation, to think creatively about how we integrate security, diplomacy and development. We have fought the war against the Taliban and the extremists. Now we must fight for peace – a lasting peace that is every bit as vital to our global and domestic security. Let us end this war in Afghanistan. Yet, if you were one of the poor souls who exclusively relies on the Post-Dispatch for their news, you wouldn't know anything about this. 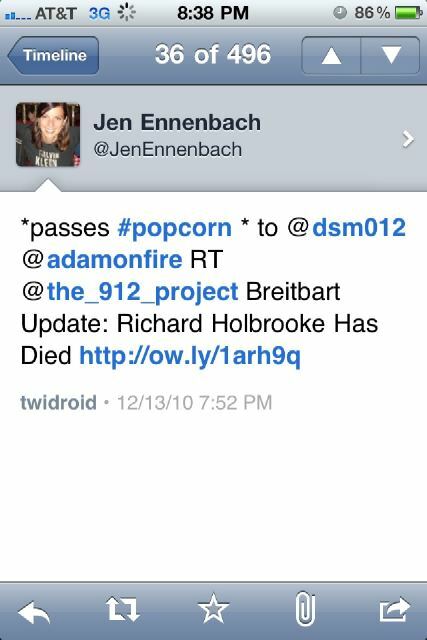 All you would know is that Russ Carnahan lauded U.S. diplomat Richard Holbrooke, who recently passed away, in part of his column. In Wagman's entire post about the op-ed, he never even mentions the central point of a post titled, "End This War." It is a truly remarkable achievement in bad journalism and, as my emailer pointed out, must have taken some effort. Shortly before giving up his House oversight post over Afghanistan, U.S. Rep. Russ Carnahan is laying out his view that the United States needs to shift its focus from war to peace. "It’s time to get smarter about how we approach this phase of our operation, to think creatively about how we integrate security, diplomacy and development," Carnahan, D-St. Louis, said in an op-ed piece published Thursday on the Washington-based publication The Hill's "Congress Blog." "We have fought the war against the Taliban and the extremists. Now we must fight for peace -– a lasting peace that is every bit as vital to our global and domestic security. Let us end this war in Afghanistan." So, just to review, at a time where discussions of changing the course in Afghanistan are a relatively taboo subject in Congress, Carnahan went out on a limb to make a pretty courageous statement about the need to change our focus. Yet, a day after turning a mindless Ed Martin tweet about a Craigslist advertisement into a story for the Post-Dispatch, Jake Wagman amazingly manages to either miss or deliberately avoid the entire point of the column. Ed Martin could not ask for a better lapdog. I guess that somehow, even at a time of crises for newspapers, the Post-Dispatch is complacent about their political coverage of St. Louis. But this will be a huge mistake in the long run. Just like a small stream of water can carve through rock over time, as enough people compare the garbage Wagman puts out on a daily basis with researched and meaningful pieces at other outlets like the Star, the Beacon or a number of blogs, they will slowly but surely begin to realize that relying on the Post-Dispatch for news about anything on Wagman's beat is a giant mistake. As long as they continue to allow Wagman to drop the ball on their political coverage, the Post-Dispatch will be hemorrhaging credibility. And credibility is all that a journalistic institution has. poet in America today, a 13th century Muslim poet - Rumi. Admission is free. A love offering will be gratefully accepted. St. Louis on the Air also had a discussion of the interesting new "hyper-local news service" Patch. , and Wagman was off to the races with his latest great story idea. Of course, I'm sure Wagman wouldn't just write about such nonsense just from seeing Martin tweet. Ed probably had to call him up and make him feel special in order for Wagman to flush the standards of decent journalism down the toilet, just like he did many times during the elections. But it is truly amazing that Wagman gets paid to do things like turning a tweet into a 6 paragraph blog post about a Craigslist advertisement, squeezed in between making casual observations about football. Who knows? Maybe the cold-hearted owners of Lee Enterprises like the world much better when reporters focus on meaningless nonsense rather than actually investigating the use and abuse of power. I will note that there are good journalists at the Post-Dispatch who still try to hold the paper to the high standards of journalism practiced in the golden days. Unfortunately, the reporter assigned to cover some of the most important political topics of our time is not one of them. 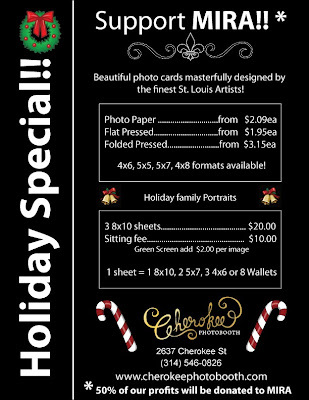 The Cherokee Photobooth is offering a very generous 50% of their profit to the Missouri Immigrant & Refugee Advocates for all of the Holiday pictures they take each Thursday and Friday from 2:00 to 7:00 p.m. and Saturday from 11:00 am to 7:00 pm between now and Christmas! Just remember to mention MIRA when you go to have your picture taken! They take great and fun photos! And the price is right! Jerry Brown cuts Education so he can Incarcerate Marijuana Smokers. Brown told the roughly 200 people at the briefing that the state's financial situation is worse than it was in the Great Depression. Well times are bad so Jerry Brown, the liberal from California, has decided he has no choice but to take an axe to higher education. After all higher ed accounts for 5.9% of the states budget. And really what return is there on education spending? Well there is increased economic activity, higher future tax revenues and lower crime but lets not get our priorities mixed up. Rachel Meyer has discovered another area which might be ripe for cuts. She begins her story of her promising client who was on the way to a better life when he failed his urinalysis for marijuana. Now her client will be just another lifer in the California system. California uses 9.7%, or 10.6 billion dollars annually to lock up 175,000 citizens. Jerry Brown is following a pattern for California by cutting education and preserving incarceration dollars.. Education spending as a percentage has fallen two thirds since 1967 while spending on prisons has tripled. Strangely Rachel is not the first to notice. In 2007 the Urban Strategies Council documented per prisoner spending at $216,000 for youth and $43,000 per adult while per pupil expenditures were less then $10,000. The long term trend does shows a general change in attitude. Certainly Nixon's war on Drugs is in part to blame but that pales in comparison to Three strikes and Your Out. Since 1993 in California the law has radically increased the number of inmates. The law has some peculiarities. While a juveniles convictions are generally sealed for purposes of three strikes and you out the records are unsealed. Thus a person with one felony years in the past can receive tow charges for his current offense and receive a minimum 25 year sentence. People have been sentenced to twenty five years in California for shoplifting gulf clubs, stealing a slice of pizza and in one case disputing a air conditioning repair bill. Since 1990 the California prison population has increased by 73%. I do not know about you but this does not look like a liberal state to me. KSDK reported today on the beating of UMSL student Brian Massey by campus police. What I found remarkable in the story is that Bob Samples, university spokesperson, states quite flatly that Massey is guilty despite the fact that multiple witnesses have come forth saying that Massey was attacked by the officers. At no point in this entire process has Samples given any indication that he is taking the student's testimony seriously. At no point has he explained what evidence convinced him that the police account was 100% accurate and that seven different UMSL students were lying about the incident. At no point has he produced a single witness that has said that Massey resisted arrest. Yet in the news report, it is stated that the university is investigating if the officers "went too far" and could have a report back within two weeks. Call me crazy, but shouldn't Samples be waiting for that report before declaring that Massey is guilty? Might he actually want to put a call out for witnesses? Maybe even talk to someone other than the police officers? If we had anything other than a lapdog mainstream press in this town, Samples would at least be required to answer the questions. Who knows? Maybe he has good answers. But we'll never know from watching Channel 5. Brian Massey, a student at UMSL, was beaten by campus police officers on November 17. He was then charged with assault and "resisting arrest," even though numerous witnesses have said that he did not initiate contact or resist the police officers. As the officer attempted to read your identification card, you attempted to grab hold of the officer's wrist and take the identification card out of his hand. The officer then attempted to arrest you for the incident. Multiple witnesses observed you resisting arrest by jerking, pulling back, and shouting at the officers. On Dec. 11, after talking KMOX into editing out witness testimony from their story, Samples claimed that Massey "tried to strike an officer:"
Samples says Massey grabbed the right wrist of an officer and was told he was under arrest. Police say, as Massey was being handcuffed, he swung around and tried to strike an officer. And now, on December 15, Samples tells KSDK that Massey "stepped on the foot of an officer, injuring that officer." Funny how he forgot to mention all of this stuff until this last week, isn't it? Students at the University of Missouri St. Louis gathered today to collect signatures in support of Brian K. Massey, the student who was beaten by UMSL campus police outside the campus radio station on November 17. Several witnesses have come forward saying that Brian did nothing to provoke the arrest and was badly beaten by the police, but so far there has been no indication that the administration or police are taking the allegations seriously. I attended the event today and interviewed three eye-witnesses who all concurred with Brian's story. So far, there have been no witnesses who have come forward supporting the police version of events, and at least 7 who support Brian's version. A third witness, Manuel Wynn, also agreed with their story but preferred not to be videotaped. A couple further notes: Kendah's story closely matches with what Brian said as the police officers seemed agitated primarily based on being angry at the crowd rather than because of anything Brian did. Also, not mentioned by these witnesses here, Brian's ID clearly states that he is disabled and Brain says that he told the police this while they were beating him. To hear Brian's version of events, tune in to channel 2 or 5 tonight (I'll update when videos are available) or listen to the Activist Hub radio interview with Brian. On Capitol Hill, Senate Foreign Relations Committee Chairman John Kerry, D-Mass., called the loss of Holbrooke "almost incomprehensible," adding that his "tough-as-nails, never-quit diplomacy" saved tens of thousands of lives. 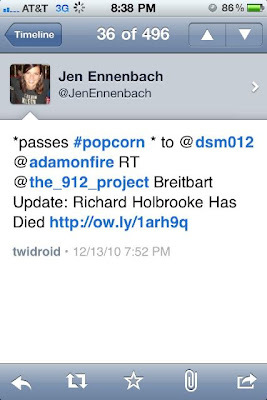 This actually isn't a first for Ennenbach, who earlier thought that it would be really funny if I choked to death. This week Adam and Kevin interviewed Brian K. Massey, a student at the University of Missouri St. Louis (UMSL), about the allegations of brutality by campus police on November 17, 2010. In an exclusive radio interview Massey gives a detailed account of the beating by the campus police. The police admit to "striking blows to soft tissue areas," but Massey states that even after informing the police he suffers from diabetic neuropathy, the brutalization continued. Massey also reveals to Student Activist Radio, a letter from the university challenging the official police claim that he "tried to strike an officer" who later "was injured." Facebook Group, UMSL Police Went Too Far!! Massey was subdued and Samples says one officer was injured. Massey says he was kicked and punched. During the three and a half weeks since the incident occurred, and despite being quoted in two stories by the student newspaper, the police had never before claimed that Massey tried to "strike" an officer, nor that an officer had been injured. Yet now with a student movement and petition starting to gain steam, all of a sudden the police are claiming that Massey tried to "strike" them. On or about November 17, 2010, campus police responded to a call regarding a student in crises at the Millennium Student Center. During this time, you were located directly outside the location the student was being assessed by campus police. Upon learning that you and the student had a heated argument just hours before, the police asked you to leave the area to which you refused. The police then asked you for identification, you initially refused this request before finally showing your identification. As the officer attempted to read your identification card, you attempted to grab hold of the officer's wrist and take the identification card out of his hand. The officer then attempted to arrest you for the incident. Multiple witnesses observed you resisting arrest by jerking, pulling back, and shouting at the officers. This misconduct is in violation of Section 200.010.B.10 "Failure to comply with directions of the University Officials acting in the performance of their duties," and Section 200.010.B.9 "Disruptive or disorderly conduct or lewd, indecent, or obscene conduct or expression." No mention whatsoever of Massey "attempting to strike" an officer in the official letter detailing his alleged misconduct. Think about that. It's also interesting that this letter claimed that Massey attempted to grab an officer's arm, whereas the official police story is that he did grab the officer's arm. It's also interesting that this account claims that Massey refused to show his identification, because in a previous story the UMSL Police Chief Van Ness said that Massey complied with requests to see his ID. ST. LOUIS (KMOX) – A November 17 altercation between University of Missouri – St. Louis police and a 46-year-old student has some calling for the police officers’ termination. Witnesses say a disagreement between Brian K. Massey, a disc jockey at the campus radio station, and another radio station volunteer led police to the Millennium Center around 5 p.m.
Massey and witnesses tell KMOX that police asked him for two forms of identification which he promptly handed over without complaint. Police then informed the criminal justice student that he was under arrest for trespassing after refusing to leave the building. Massey and witnesses say he was grabbed by police, handcuffed, and then thrown against a concrete column without provocation. UMSL spokesman Bob Samples, meanwhile, says Massey grabbed the wrist of one of the officers and resisted arrest. Witnesses say that’s when the crowd, which had gathered as classes let out, became heated. Witnesses say Massey displayed “amazing calmness” as he was struck, eventually going down on one knee in hopes of avoiding further confrontation. But, he says, that only made him an easier target. It was only when a campus employee stepped between the officers and Massey did the beating come to an end, according to witnesses. Massey says further improper treatment followed, including having his leg slammed in the police car’s door. He was charged with three misdemeanors – resisting arrest, assault, and trespassing - along with one felony count of assault of a police officer while undergoing treatment for his injuries. Massey was also suspended from the UMSL campus after being released on bond and told to leave his UMSL-owned apartment during which time he visited family in Chicago before being told he could return. He says he’s since been hounded by police and lives in a state of fear and paranoia. Massey also alleges that members of the UMSL administration have pressured him into not appealing the allegations against him and instead suggested that he remain quiet. But, he says, as a criminal justice major, he has been taught that keeping quiet simply isn’t right. As for what he wants from UMSL police and administrative staff, Massey says he just wants to be exonerated. Meanwhile, some of Massey’s fellow students are calling for more than just exoneration. “Ultimately, we want these officers removed from campus,” one student said. Massey has said he will support the sit-in and similar protests as long as they remain peaceful. “If they’re going to go out on a limb for me, the least I can do is be there to support them supporting me,” Massey said. Organizers say Massey has shown incredible resilience throughout the ordeal and that they hope to forward his positive, peaceful way of thinking. Many people have suggested the attack on the African-American Massey by white officers was racially motivated but Massey disagrees. “No, I don’t think race played a role in it,” Massey said. The editor I spoke to said that he "balanced" the story after speaking with an UMSL official. However, if you look at the new story, you'll see that it only tells the UMSL police account of the incident. It is, in fact, far less balanced than the original story. However, today, at the exact same link, all of that text has been removed and the story has been changed to include only the statements of Massey himself as the counterpoint to the official UMSL police account. The reports from witnesses have been entirely removed. I can see why they'd want to update their story after speaking with UMSL, but I don't understand why a news organization would remove eye-witness testimony from their story. I called the KMOX newsroom and spoke with a very nice and helpful woman, but the person who edited the story was not yet at the station. I'm hoping to speak with him later today. Van Ness said the student complied when asked for identification, providing both a state ID as well as his UM-St. Louis student ID. “But as the officer walked him out he grabbed the officer’s wrist and tried to remove documents from officer’s possession,” Van Ness said. The student was then told he was being placed under arrest. Van Ness also commented on a second story in the UMSl Current, and again said nothing about Massey trying to strike officers or officers being injured (note as well that the articles has several witnesses taking issue with the claim that Massey grabbed the officers arms). So we are now supposed to believe that Massey was beaten because he tried to strike an officer and that an officer had been injured, but that the police had just forgotten to mention those facts for the past three weeks? At this point, as someone who has been closely following the story, I know of at least five people who have witnessed the arrest. Absolutely none of them have said that Massey tried to "strike" the officer. This is a story for good journalists to dig in to, not run away from, and I hope KMOX steps up to the plate. Update: I spoke with the editor who said he changed the original story. He said he was "balancing" the original story after speaking with UMSL officials. He also said that they removed the witnesses from the updated story because they had spoken to any of them directly. But, of course, the original articles in the UMSL Current cited at least three witnesses who all disagreed with the official police story. This week Adam and I interviewed Digby, a luminary in the progressive bloggersphere, about the Obama Administration, Republicans, and what progressive activists have cut out for themselves during these next two years. Digby as usual provides insightful commentary so sit back, relax, and enjoy this week's show! Naturally, KMOX doesn't provide any acknowledgment of this blog, of the St. Louis American (which wrote about the story on Friday), or of the UMSL Current, the newspaper that really broke the story. But whatever: I'm just glad the story is finally getting out, and KMOX does do a nice job digging into the details. 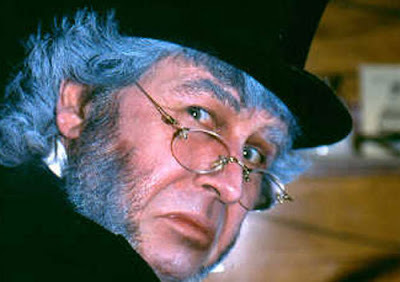 In Surprise Upset, Pinnacle Entertainment Overtakes Rex Sinquefield for Scrooge of the Year! Heading into yesterday's Scrooge of the Year Party hosted by St. Louis Jobs with Justice, it looked like Rex Sinquefield would run away with the title after his successful effort to threaten St. Louis and Kansas City governments with the elimination of the earnings tax. Sinquefield had over 400 votes, and only one of the other candidates had even reached 100 votes. However, Unite Here stepped up to the plate for their candidate, Pinnacle Entertainment, who muttered a giant "Bah Humbug!" while stomping on the rights of workers who had voted to unionize earlier in the year. The St. Louis Tea Party Leadership (hmmm, wonder who might have nominated them) finished a distant third. Pinnacle Entertainment beat out Rex with a whopping 2544 votes! Rex Sinquefield was the first loser with a solid 1910 votes! St. Louis Tea Party Leadership finished in 3rd place with 505 votes! Senator Roy Blunt elected 4th place with 370 votes! Write-in Candidate Riverview Garden’s District Superintendent Clive Coleman finished in 5th place with a respectable 143 votes. It was a great event with lots of local celebrity organizers and activists in attendance. If you didn't make it this year, you should definitely put it on your calendar for next year and remember to VOTE! So several of us bloggers have been thinking a lot over the past few months about how we can build a better sense of community among the people who create, consume, and share the information that progressives care about in the St. Louis region. As an initial step in this direction, we're having an Online Organizing and Community Building Workshop this Saturday from 9 AM to 4 PM at the Regional Arts Commission on Delmar. It will be free, but RSVPs are required. 9 AM - 9:30 AM Introductions (bagels and coffee provided): In addition to the great workshops, a huge part of the value of this gathering will be the opportunity to network with other bloggers, citizen journalists, activists and assorted wonderful progressives. Please try to be there at 9 AM sharp to help kick start the conversation about how we can build a stronger community. 9:30 AM to 10:30 AM I (Adam) will be facilitating a discussion among a great panel of guests about the current political situation in Missouri. There will be a number of huge, important political fights coming up in the next year that will inevitably shape the trajectory of our work. The panel will include Sean from FiredUp Missouri, Lara Granich of Missouri Jobs with Justice, as well as Paula Hodges and Otto Fanjen from the Missouri National Educators Association. All of these panelists will have an excellent big picture perspective on the issues that will be front and center in 2011. 10:30 - 11 AM The brilliant Sylvester Brown, former Post-Dispatch columnist and currently collaborating with Tavis Smiley, will discuss the state of the media. Understanding the limitations of our media's ability and willingness to cover the issues we care about will provide helpful context as we think about how we can improve our ability to create, organize, and communicate important information. 11 - 11:30 AM I'll be discussing a new project that's been developed to help foster community among progressive journalists and online activists, as well as create an incubator for progressive citizen journalism. This project will provide a vehicle for progressive ideas to find a larger audience, and will help to provide a shared knowledge base that can inform our future activism. I wish I could say more, but you'll just have to wait until Saturday. 3:30 to 4 PM Debrief and Moving Forward! A huge thanks to the Regional Arts Commission for hosting us, and to the AFL-CIO, AFSCME, Missouri Jobs with Justice, and FiredUp Missouri for sponsoring the event. Thanks also to Gloria and Stacy from Occasional Planet and Jerome Bauer for project-related help, and to Juan Montana from Cherokee Photo Booth for some excellent advice and assistance. Also special thanks to Ed Reggi and Sean from FiredUp for taking care of a lot of the logistics. 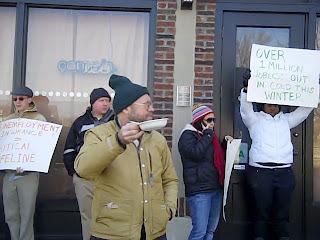 Missourians Urge Sen. McCaskill: Extend Unemployment Insurance Now! Jobless workers, community activists and union members stood in the freezing cold on Tuesday in St. Louis, part of actions across the country for the AFL-CIO Day of Solidarity with the unemployed. They called on Senator Claire McCaskill to immediately restore unemployment insurance for a year for the million jobless workers currently without any aid, delivering petitions signed by thousands of Missourians. Right before leaving for the Thanksgiving holiday, Republicans Akin, Blunt, Emerson, Graves and Luetkemeyer voted to deny this critical lifeline to jobless Missourians. To remind the public about the catastrophic results of the vote, and to demonstrate the urgency to Sen. McCaskill, participants formed a soup line down Delmar Blvd. The Depression-era image of people standing on the streets, in the cold, waiting for a free meal was more than symbolic. If immediate action isn't taken, millions of jobless workers and their families will literally have no options this winter. Fifteen million Americans are currently unemployed, with over 278,000 in Missouri. By the end of December, 2 million people will have lost this critical lifeline unless Congress acts to extend unemployment insurance. Lloyd Schultz, jobless worker from St. Louis said, "I can't wait to go back to work. 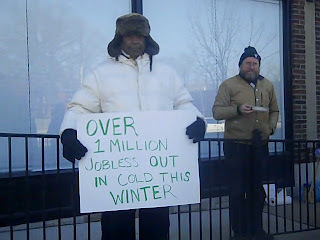 Unemployment insurance is the only thing keeping many of us with a roof over our heads and food on the table this winter." The student witnesses take particular exception to Police Chief Forest Van Ness’ claim that Massey grabbed at the arresting officer when the officer was placing handcuffs on him. “As he was being arrested he was just asking why and asked if he could just put his wallet back before being handcuffed,” Kendeh Isom, senior, biology, said. It was after asking why he was being arrested, according to Isom, that Massey was thrown on the ground and dragged out of the MSC lobby and into the part of the building where The U is located as well as several other offices, including the Center for Student Success. While in this area of the MSC, Isom said that the door was open and she and several others could see two officers on top of Massey, one punching his legs and another hitting Massey’s head into the ground. She said Massey was making no attempt to resist or fight back while on the ground. Dasma Hopkins, junior, media studies, who was also in the MSC at the time of the incident gave essentially an identical account of the events as Isom did. Both Hopkins and Isom’s accounts coincide by and large with what Justin Collins, senior, studio art, told The Current previously. Isom also said that she felt that the UM-St. Louis Police were “nonchalant” when taking her statement and she feels as though they will not be taking what she or any of the other student witnesses say seriously. Massey was not being disruptive. He was sitting on the chairs outside the radio station, according the the original reports. The U radio station has two rooms within the student center. I could see why the Sports Director might have authority to kick a student out of the station, but Massey was not in the station. So I have a hard time seeing how the Sports Director asking him to leave would count as an official "acting in the performance of their duties." On Wednesday, Nov. 17, Brian K. Massey, a University of Missouri-St. Louis student, was arrested near The U radio station in the Millennium Student Center. According to UM-St. Louis Chief of Police Forest Van Ness, Massey, who is an employee of The U, was charged with felony assault of a police officer and three other misdemeanors including resisting arrest. Van Ness said that the officers first used knee strikes to the outer area of the student’s thighs. The knee strikes were deemed to be ineffective. “At that point we did strike student several times in the thigh area with closed fist,” Van Ness said. “As soon as the student stopped resisting, all our force stopped,” Van Ness said. He believes the officers acted appropriately and are still in the process of receiving statements. I've met Brian several times at the radio station, and he's always been incredibly nice and helpful. He does not at all strike me as the kind of person who would be violently resisting arrest. Also, I have to add, that it sure seems to me that as a campus police officer, you should do everything you can to avoid beating up a student at your university. Even on the police officer's version of events, it seems obvious to me that this did not happen. But right now the details are murky and the only reporting that has been done on this was a short story in the UMSL student newspaper. I really hope someone gets to the bottom of this. Stop Complaining and Start Organizing! The level of vitriol being directed against President Obama and the leadership of the Democratic Party has reached a fever pitch recently. An apparent willingness to cave on tax cuts for the wealthiest 2% of Americans, the possible endorsement of recommendations to mess with social security and/or Medicare, and a general feeling that the White House has not taken the Left seriously have resulted in an enraged group of progressives, especially among the national blogging community. It has even led to vicious infighting between those who think that Obama is a "lost cause" and those who think that he has produced important achievements that lead to a better world. And while I certainly have been disappointed with the apparent failure of Democrats on a number of issues, I think it's extremely important to put this disappointment in perspective. My basic thesis is this: simply complaining about the President or the Democratic Party without organizing people to fight for progressive values is worse than meaningless: it is destructive to a progressive vision of the world. Of course there is the usual reason for thinking this: putting Republicans in power over Democrats would result in a far, far worse reality that not only would result in vastly more suffering and economic disparity but would further stack the deck against progressives. Remember that Republicans in power don't just pass a couple laws to benefit their rich friends: they actively utilize every level of government to make it more difficult for the working class to organize against the powerful. But I think even being aware of these considerations, many people feel that it's important to send a message to Democrats that we are tired of them caving in, of adopting the Right-wing narrative on issues, and of sometimes not even bothering to address the concerns of progressives. The belief, I take it, is that complaining about the Democratic Party, or declaring that you're not going to vote for them, or doing whatever else it is that expresses your anger, will "punish" them and show them just how important it is for them to take progressives seriously. Unfortunately, however, I don't think this approach has any chance of working. Why not? Because, as we have seen over and over, Democrats rarely take the right message away from losses in popularity or losses in elections. However much noise progressives make about Democrats losing because they ran away from the base, there will be twice as much noise from the Right and the Church of Conventional Wisdom (i.e. the traditional media) that argues that Democrats lost because they weren't conservative enough. Progressives, as is often the case, think that the Democratic Party (or the media, or whomever) should listen to us because we're right. Unfortunately, however, the reality is that a great many politicians and establishment figures do not really care if you're correct: they primarily care if you are powerful (*I should note that I do believe that people value the truth and strive for it in the right circumstances: however, this urge is often overwhelmed by other aspects of our psychology). With this in mind, I believe that the only real way to "send a message" is for progressives to actually organize and to gain power. This means, at a minimum, connecting people with shared values and improving lines of communication among these people. It is extremely important, in my opinion, to organize independently of the Democratic Party with a group that has specific progressive aims. Does "working independently" mean opposing Democrats? Not really. It means approaching issues with a calculus that determines what best furthers that group's values. It means having the ability to work with Democrats when that supports one's aims: and having the ability to work for other things if Democrats are not supporting those aims. In my opinion, in today's world, this will 99% of the time mean that a progressive organization will end up supporting a Democrat in an election where only a Democrat or Republican can win, since Republicans do serious harm to our country. Working for Democrats during elections is often important; however, it also carries with it the difficulty of "sending the wrong message." But working for a Democrat on behalf of a progressive organization, Pro-Vote for example, sends a clear message. That politician will know exactly why the organization is being supportive. In many ways, I think the often vicious and destructive debate about whether Obama is doing his best in a environment stacked against him or selling out is a distraction. No matter where Obama falls in the spectrum between those two extremes, what we should be doing is the same: we should be organizing and building power for the causes we believe in. There are ample opportunities to do so in St. Louis. Missouri Jobs with Justice (along with other groups) used the ballot process to take the minimum wage increase directly to voters and won. Missourians Organizing for Reform and Empowerment (MORE) are directly taking on the big banks that are still screwing people over even after being bailed out by our government. If you're interested in elections for political candidates, then you could work for Pro-Vote. Or, for something more low-key, there's a lunch for progressives the first Wednesday of every month. And, of course, you could always start your own endeavor. Whether you're an introvert or an extrovert, have huge amounts of time or only a little, there are an indefinite number of ways to build progressive power that are probably a better use of time than arguing about whether the Democratic Party is "good" or "bad." Debates about whether Democrats are corrupt or redeemable are interesting. However, they are often extremely destructive among people who largely share the same values (but disagree about the facts, or about the best way to achieve certain ends). And, ultimately, I think that arguing about these issues is ultimately a much less effective use of time than trying to get out and actually organize people with progressive values. Once the Left actually gains some power (the ability to move people or money), the other problems will be easier to address. The power to help Democrats win or lose the next election is not real power. Real power is the ability to achieve positive policy goals. And this is what we should always be keeping in our mind as internal debates on the Left continue to pull people apart who should be working together. Recall that Todd Akin, Roy Blunt, Jo Ann Emerson, Sam Graves and Blaine Luetkemeyer all voted to block unemployment benefit extensions. Republicans in the Senate are similarly preventing passage. Using a wily procedural maneuver to tie Republican hands, House Democrats managed to pass, by a vote of 234-188, legislation that will allow the Bush tax cuts benefiting only the wealthiest Americans to expire. Though this is a nice start, it's unlikely that Republicans will let this pass in the Senate. But at least we can make and have made them vote against the cuts. I actually agree with Duncan Black, who says we should just let the "Bush tax cuts" expire and then introduce the shiny new Obama tax cuts. But I suppose that would be much too uncivilized. 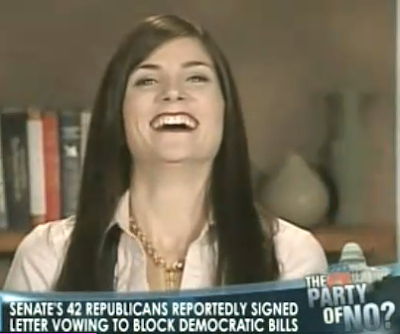 Shorter Dana Loesch: Screw the Unemployed. I Need My Upper 2% Tax Cuts! Stop the presses. Dana Loesch is upset about a very important cause: herself! If Congress doesn't vote to reinstate the Bush tax cuts for the wealthiest 2 %, she and her husband will have to pay more taxes! Which confirms everything she's always argued: people who make over $250,000 are the most oppressed population in history. As for the folks on unemployment who were cut off from any benefits this week by Republicans in the Senate, well Dana thinks they can keep warm this winter by thinking about all of the tax breaks that the uber wealthy should be getting. Yes, really.